Descendants of those who fought in World War II joined a procession in the British capital on bearing portraits of their ancestors to mark victory in May 1945. More than 1,000 people marched through central London from Trafalgar Square to the Houses of Parliament on May 9 in an “Immortal Regiment” in memory of their relatives who fought in World War II. The mostly Russian participants sang songs and carried portraits of their grandparents high above their heads: veterans and home front workers, members of the resistance, children of war and those who were prisoners in concentration camps or survived the Siege of Leningrad. 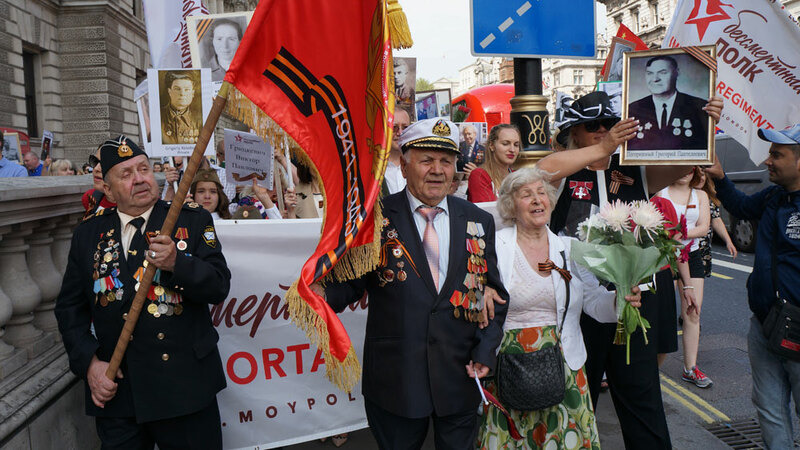 The “Immortal Regiment” procession brings together thousands of people each year across Russian cities and around the world, but this year marked the first time it had taken place in London. Each old black and white image, printed on paper and carried aloft, tells the true story of life. Olga Amelchenko, one of the participants, came to London from the southwest of England only to march to remember her relatives. During WWII Amelchenko lost 17 family members, the fate of most of which is still unknown. One of her grandfathers, Pavel Mukvich, died in battle. The last contact they had was a letter from Stalingrad. “He wrote he would never come back because it was hell on earth there. He asked to take care of children and give then a good education. That’s it. We have no photo of him, only the ones made before the war,” said Amelchenko. Even now, telling the story brings her to tears. Another participant, Maxim Poptsov, marched with a portrait of Tatyana Petrova, his grandmother. She survived the Siege of Leningrad, but her eight brothers and sisters died. Several Britons also participated in the march. Richard Campo joined the procession in memory of his Polish grandfather Michael, who fought with the Allies in Italy. “For me being here today is a way of showing my respect. When I was a boy, I used to wear all his medals. I’m quite proud of him, it’s nice to bring him back to life in this moment,” said Campo. The procession was headed by war veterans. Boris Davidov, who used to be a sailor of the Black Sea fleet, was a mine sweeper at sea. According to the organizer of the project, Tatyana Campo, it took several months to make the idea a reality. The idea occurred to Campo, both of whose grandfathers fought in the war, in 2015 after she visited Moscow and took part in the procession of the Immortal Regiment. “I wanted my daughter to see the Russian celebration of Victory Day. She grew up in the UK and didn’t know much about it. She was crying the whole way back and we decided we couldn’t help but organizing the same in London,” said Campo. Immortal Regiment processions also took place in various other countries around the world, including Italy, Qatar, Argentina, China, Bulgaria, South Korea, France, the U.S., Lebanon, Austria, Malta, Greece and Germany. Europe marks Victory Day one day earlier, on May 8 – it is celebrated on May 9 in Russia because due to the time difference it was already May 9 in the USSR when the German surrender was signed in 1945.